Most people think of anything that falls on the eleventh day of the eleventh month as being a time to commemorate the brave men and women who have served in the Armed Forces. That, obviously, is a wonderful tribute to their sacrifice and is a worthy use of this day. But this year, there is an added element to the gravity of the day. 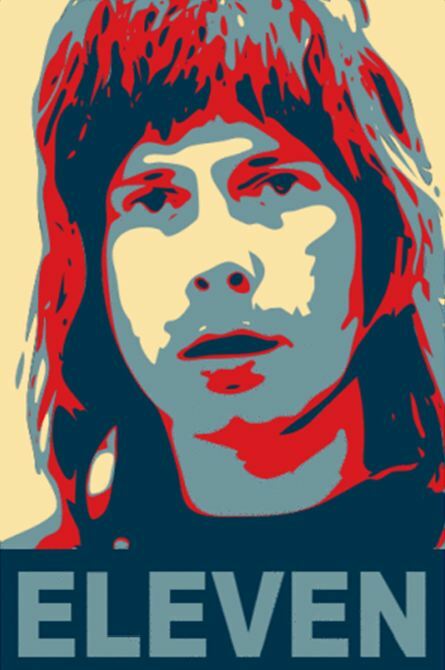 This day in this year, 11/11/11, Nigel Tufnel Day. I believe this has something to do with some apocalytic countdown attached to the Mayan Calendar. Nigel Tufnel was, and is, the lead guitarist for the band Spinal Tap, the heavy metal rockers who were the subject of the celebrated film mockumentary This is Spinal Tap from director Rob Reiner back in 1984. As played by Christopher Guest, Tufnel is best remembered for the part of the film where he is showing his guitars to Reiner and explains why the dials on his amps all go to eleven rather than ten, the normal top number on most numeric dials. It is a classic bit. The film has become a classic, deemed “culturally, historically, or aesthetically significant” by the Library of Congress in 2002. The film popularized the mockumentary style and Guest has made a great series of films based on this format of a traditional looking film dockumentary using a reperatory of actors and improvised (and often very funny) dialogue. Best in Show, A Mighty Wind and Waiting For Guffman are all exceptional examples. So, today, at the clock strikes the eleventh minute of the eleventh hour of this eleventh day in the eleventh month in the eleventh year of this decade, I will first say a silent thank you to honor the service of all the troops, past and present. Then I will plug my guitar into my amp and turn it up to eleven. I can’t embed the actual that started the ball rolling for Nigel Tufnel Day but you can watch it on Youtube by clicking here.